Waterfalls, nightclubs, geothermic mud pools, mountains, skylines, if NZ doesn't impress you, best check your pulse. 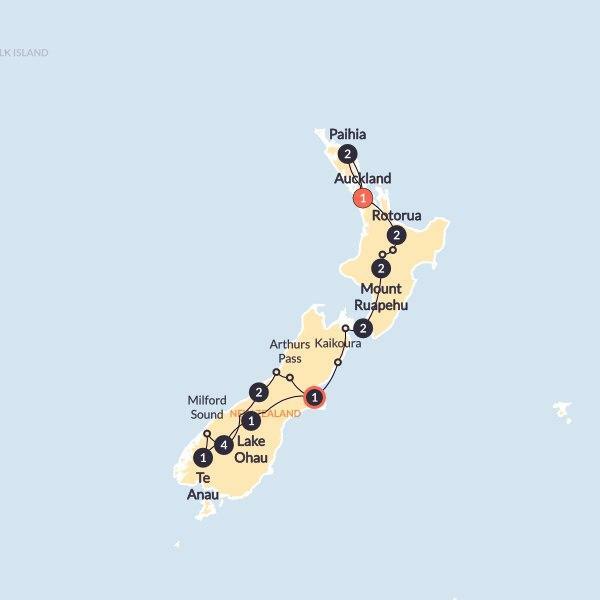 The Big Tiki from Auckland to Christchurch soaks it all up and offers an astounding list of over 70 optional activities to ramp up your trip. Skydiving anyone? Feeling salty and sun-kissed we wave goodbye to Paihia & sashay our way back down NZ in the direction of Auckland, eager to carry on seeing what else this fine country has in store. Ask your Trip Manager for a bit of intel on the local lingo around here, sure to be the best way to make you feel right at home amongst the Kiwi crowd. Thought we’d “done Auckland” already? Oh hell no. Today is all about discovering yet more of this energetic city, starting with a free night to explore Auckland’s great nightlife. Laters Auckland! Today we drive through the lush farmlands of Waikato, an area that produces many of New Zealand's best Rugby players for the All Blacks, on route to Hobbiton Village. That's right, it wouldn't be a complete experience without a stop at the "Shire".When you catch your first whiff of that .. 'unusual' sulphur smell, you'll know we've arrived in Rotorua. Famed for its spurting geysers, boiling mud pools & hot springs, gondola and speeding luge rides, Rotorua is a natural wonderland, and then some. Tonight the culture will sky rocket with a traditional Maori hāngi dinner & dance performance, and perhaps best of all, the chance to get involved in the world-famous HAKA. Tongues at the ready peeps. Our Rotorua adventures are (almost) at an end, but not before we stop by the Rainbow Springs Nature Park, where you’ll get the chance to learn about New Zealand's national bird, kiwis. Like nice surprises? Here’s one for you - your included entrance fee goes towards the kiwi rehabilitation project, a Contiki sponsored initiative. Plus, as part of the project Treadright sponsors an incubator used to hatch eggs, so every year we get naming rights to two new baby kiwis. Cute, huh?220,000 litres (that's 58 000 gallons) of water gush over Huka Falls per second. Just let that sink in for a minute. Wild, right? Even wilder still is the Hukafalls Jet experience - a thrilling ride that will get you experiencing the full force of the falls and leave you with even more of a taste for adventure. A good thing really, given Lake Taupo is on the horizon.We'll break up our journey today with a nature jaunt to gorgeous glassy Lake Taupo.Then it's on to Mt Ruapehu for some powder riding fun. Whether you consider yourself a pro, or perhaps just an aspiring ski enthusiast, this is the perfect place for you to ‘slide’ into new adventures. And yes we do make excellent puns. Known as the après-ski capital of the North island, Ohakune is a tranquil town with utterly unreal views. Spend the day bettering your skills on the slopes or generally treating yourself to all the snowy based activities on offer, then tonight snuggle down in our Special Stay ski lodge, located in prime position at the base of Mt. Ruapehu. These landscapes are unique and the sights will leave you breathless. On route to the windy capital Wellington where we'll show you the sights of this city.As much as we've been loving the nature time, the change of scenery to New Zealand's well-cultured capital will prove an utter delights. After an orientation through the narrow streets of Wellington a night on the town will be on the cards, plus an optional dinner to start the night off as we mean to go on. We'll get 24 of your meals, you get the rest. You can expect a healthy breakfast every morning, as well as authentic fish 'n' chips and a few BBQs along the way. We'll also give you plenty of opportunities to try the best gourmet eats in NZ.